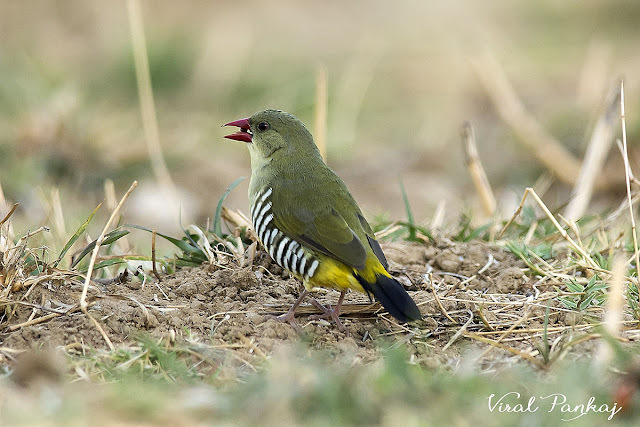 Whenever we saw photo of Green Avadavat most of time its from Mount Abu. In summer of 2014 we went to Mount Abu to meet our friends Dr Nipa and Dr Divyesh. They are repeatedly telling us about Green Munia. We did some tracking at early morning. We started our search for munia in evening. While entering to the Trevor's Tank the guard informed us that we can see green munia at Oriya village. So we dropped the plan of the tank and headed towards Oriya village. We saw flock of munia foraging and calling in open field. The green avadavat or green munia (Amandavaformosa) is a species of Estrildid finch with green and yellow on the body, a bright red bill and black "zebra stripes" on the flanks. They are endemic to the Indian subcontinent and were formerly popular as cagebirds. The name "avadavat" is a corruption of the name the city of Ahmedabad in Gujarat, India, which was a centre of bird trade. They have a restricted distribution and populations are threatened by the bird trade.